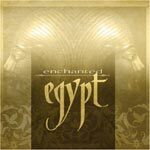 On this album we have been able to combine our shared love of working with creative musicians from around the world with a new vision of Egypt and her Music. Hossam and I have covered a lot of musical ground in the 6 years since we worked together on ‘Immortal Egypt’. On this new album we have taken this technique a stage further. Hossam now has a studio in Cairo so we were able to bring musicians in while the songs were being developed, sometimes bringing people back several times to fill in gaps or create new improvisations as the arrangements came together. Hossam has a fantastically creative group of musicians, whom he works regularly with; many of them have recorded exceptional solo albums showcasing their individual styles and presenting the beauty of their respective instruments. This new group of musicians were invaluable in allowing us to take our compositions a stage further. In particular the addition of the Qanun and Magrouna to our sound palette has been a huge inspiration. Phil Thornton To write a review about this album and share your thoughts with other customers please scroll down the page.